From undefeated regional standout fighter to Dana White’s “Lookin’ For A Fighter” series spectacle, Mickey Gall (2-0) has done nothing short but leave the fans wanting more. The “Big Man”, Dana White attended one of Gall’s fights while on tour and was impressed and sold on Gall enough to to give him the opportunity which a lot of fighters have lobbied for, to fight WWE sensation, CM Punk (Phil Brooks) in his pro MMA/UFC debut. Unfortunately, that fight has been pushed back as Punk will undergo surgery next week. The surgery, however will not keep Punk sidelined for too long, and the Gall/Punk fight WILL happen! It just won’t happen as soon as we had thought and hoped for. MyMMANews reporter, Adam Crist had the pleasure to catch up with Mickey Gall to discuss the recent news about Punk pushing back their contest, his UFC debut, and much more! 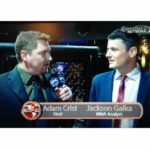 Tune in below as Adam Crist goes head to head with Mickey Gall to for the recent news!